Basement: Yes, Full "Fully finished w/in law suite"
Size: 2,258 sq. 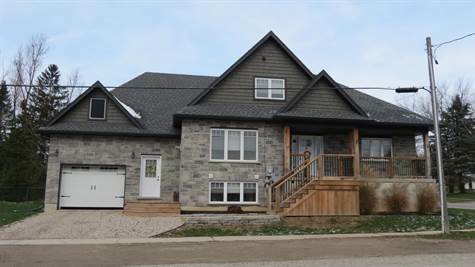 ft. "Not including lower level"
One of a kind, meticulously designed bungaloft style home, built in 2015 with every single detail in mind. Open concept main floor with a gorgeous stone wall fireplace seating area as you walk in, huge kitchen with all the cupboards and counter top space you could ask for! Granite counters, walk in pantry and a large island to gather around. A separate family room off to the side, bedroom, laundry and a 4pc bath is all you need for main floor living and less stairs. The second floor holds the master bed w/gas fireplace, large walk in closet and very spacious 3pc ensuite. The lower level features large windows throughout & 2 separate walk outs. 3 beds, large eat in kitchen, den, living room, loads of storage space and in floor heating throughout! This home was spray insulated which means gas and hydro bills are low! The attached oversized one car garage is deceiving from the outside its actually an L shape 25' long and at the back 21' wide! it has a nice high ceiling, fully insulated/drywalled and has more storage area built in as well as 220 service for the hobbyist in the family. Have you been throwing around the idea of buying a home for yourself and aging parents or vice versa? Or looking to buy something where you can also get some rental income out of it to help pay the mortgage? If so you need to see this home. Wired and ready for a generator. Lots of parking available out front of the home as well as the driveway fits 2 with room to widen. Come home to a quieter way of living in Alma, being only 25 min to Guelph, 30 min to Waterloo, 15 min to Fergus makes the commute an easy one.